Excalibur’s redesigned EX-30 uses the same tilting-head technology as the EX-21. The Excalibur EX-30 is one of the largest saws on the market. 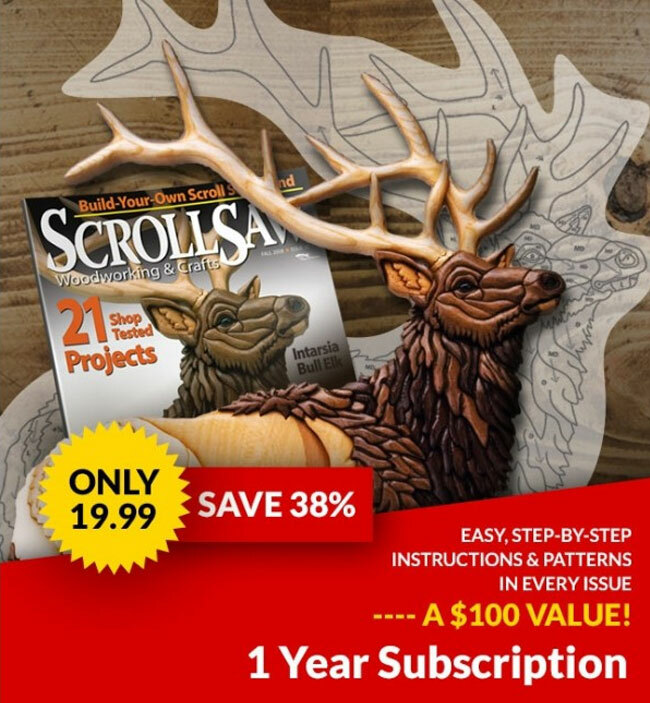 The generous 30″ throat means you can cut projects up to 30″ long without using spiral blades. The EX-30 is also capable of cutting wood up to 2″ thick. 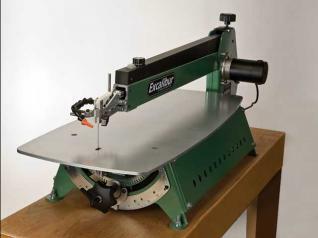 General International redesigned the EX-30 scroll saw using the same technology which debuted on the EX-21. The most significant change is that the EX-30 now features a tilting head instead of the traditional tilting table. Scrollers will also notice the Excalibur’s trademark purple color has been replaced with the traditional green historically associated with all General tools. The first thing that struck me about the EX-30 is how easy it is to square the blade with the table. With other saws, you tighten the table-locking screw enough that the table does not move, but loose enough that you can adjust the table with a well-placed rap. The rack-and-pinion system that controls the tilting head makes squaring the blade as easy as turning a knob. On most saws, the angle marks that indicate the tilt of the table can’t be trusted for perfect accuracy. But that’s not the case with the EX-31. It features a springloaded cam that locks into precision-machined holes at most common angles. When I used the cam to lock the head at 0° (no tilt), the blade was perfectly square to the table. It took seconds to do a job that can take me several minutes with other saws. 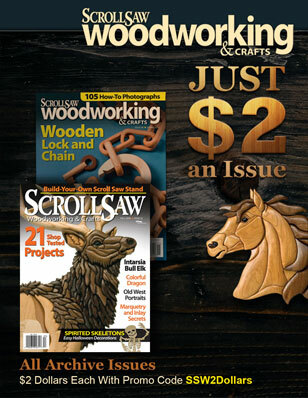 The power switch and speed control are both conveniently located on the front of the scroll saw arm. The quick tension release is right above the blade-locking thumb screws. Unfortunately, the blade-tensioning knob is on the back of the arm, and since that is more than 30″ away from the front of the saw, you need to stand up or lean quite a bit to adjust the blade tension. I prefer the tensioning system on the EX-21, where the tension control is located at the front of the arm. When it comes to cutting, the saw breezes through even the hardest woods. I cut a unicorn puzzle, designed by Judy Peterson, out of black Alowood in less than an hour. Black Alowood is supposed to be as hard as ebony, and it’s the hardest wood I’ve cut. At the EX-30’s top speed, I didn’t notice any speed reduction or power loss; the saw cut as fast as I was comfortable feeding the wood into the blade. The EX-30 is set up to feed the blade through blade-entry holes from the top or the bottom. I prefer top feeding, which means that I loosen the blade from the bottom holder and lift the saw arm to remove the blade from the fret. From there, it’s a simple matter of positioning the blade over the next blade-entry hole and feeding it down through the hole. The bottom blade holder features a slot that you slide the blade into. It’s much easier than some other saws where you have to line the blade up with a small hole. Initially, the dust blower wouldn’t stay where I positioned it. I talked with Ray Seymore from Seyco (the largest retailer of Excalibur tools in the United States). He suggested I remove the “pop link” where the dust blower connects to the scroll saw head. I took out a link, pushed the blower tube back onto the connector, and was back scrolling in minutes. With its tilting head, which makes setting cutting angles a breeze, and the ability to cut large stock with ease, the EX-30 is an excellent choice for serious scrollers. The EX-30 retails for $999 + $119 s&h without a stand, and $1,149 + $131.75 s&h with a stand, which puts it in the same range as the Hawk G4 and the Hegner Multimax 18V. The EX-30 is available from Seyco, 800-462-3353, www.seyco.com.